A natural disaster can be defined as some impact of an extreme natural event on the ecosystem and environment, and on human activities and society. The concept relies on the interaction of a natural agent—the hazard—with human vulnerability to produce a risk that is likely to eventually materialize as a destructive impact. ©Vittoriano Rastelli/Corbis. Reproduced by permission. The driving force, or trigger, of disaster is the natural agent. In this context natural disasters are distinguished—earthquakes, floods, hurricanes, landslides, volcanic eruptions, and so on—from technological ones (toxic spills, transportation accidents, explosions in industrial plants, etc.) and social disasters (riots, acts of terrorism, crowd crushes, etc.). Experts on natural disaster tend to confine the definition to extreme geophysical phenomena and not include disease epidemics and the corresponding afflictions in animals (epizootics) and plants (epiphytotics), although phenomena such as locust infestations are sometimes considered. Epidemics are excluded mainly in order to narrow the field to manageable levels, rather than as the result of any theoretical justification. Indeed, students of disaster increasingly prefer not to distinguish between the three categories, which overlap considerably in terms of their effects, if not their generating mechanisms. Hazard, the catalyst for natural disaster, is subject to rules of magnitude and frequency. Generally, small events tend to be relatively frequent and large ones infrequent. 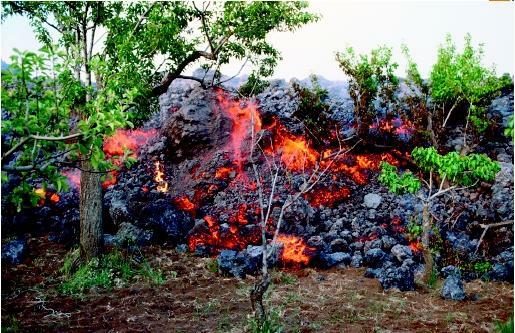 In this context, considerable problems arise in preparing for large volcanic eruptions, as the timescale on which they may occur (e.g., once every 10,000 years) can be very different from that of human organization (months and years). In their more benign, everyday forms, many natural hazards can be considered as resources. Water, for instance, is a life-sustaining resource unless it comes in excessively large or small quantities, giving rise to flood or drought, respectively. The variation of flood hazards from very abrupt flash floods to much more slowly rising inundations, caused, for instance, when rivers swell from the gradual melting of snow, illustrates that hazards can strike along a continuum, from instantaneous impact to the gradual or long drawn-out effects of the so-called creeping disasters. The archetypal sudden-impact disaster is the earthquake, which usually strikes without warning and causes its worst effects within a minute or two of inception. At the other end of the continuum, one might regard accelerated soil erosion and desertification as creeping disasters, which may take years or centuries to reach catastrophic levels. Magnitude alone does not govern the hazardousness of an extreme natural phenomenon. Consider, for example, the Sherman landslide that occurred in central Alaska in 1964. About 29 million cubic meters of rock debris traveled more than five kilometers at an estimated maximum speed of 180 kilometers per hour. However, as the event took place in an uninhabited area and had no real human consequences, it was a mere geological curiosity, not a disaster. In contrast, the landslide of October 21, 1966, at Aberfan, South Wales, involved one-hundredth as much debris traveling one-twelfth of the distance at one-twentieth of the speed, but it demolished two schools and an area of housing, resulting in 144 deaths, 116 of them schoolchildren. It was thus a very significant disaster. 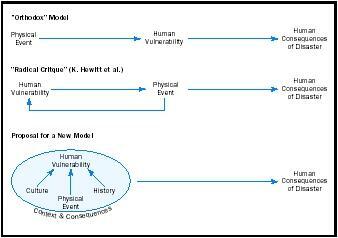 This illustrates that human vulnerability is a fundamental determinant of disaster potential. Natural catastrophe has often been studied using as a basic model the disaster cycle , which emphasizes the common repetitiveness of disasters. Five phases are distinguished: (1) mitigation, a period of inactivity in which there is time to reduce the risks of disaster; (2) preparation, in which hazard monitoring and forecasts show the need to prepare for an impending event; (3) impact and emergency response, the short-term aftermath in which basic needs such as food, shelter, and public safety must be met; (4) restoration and recovery, in which basic services are restored; and (5) reconstruction, in which the damage is repaired, perhaps over an extended period of time, a decade or more if the catastrophe was significant enough. Each phase has its own set of requirements and, in a well-organized society, programmed responses. The worldwide picture of disasters shows that death tolls are fairly stable, although not significantly decreasing, but losses are rising steeply. Social, economic, and military instability coupled with high rates of population growth fuel increases in the casualties and hardship caused by natural disasters in developing countries. Since the early 1990s much attention has been focused on the complex emergency , in which persistent warfare, particularly of the low-intensity guerrilla kind, leads to social and economic breakdown, which then interacts with repeated natural disasters, especially flood and drought. Much of the complexity of the resulting situation lies in trying to end the conflict while reinstating sustainable development and disaster efforts, or at least avoiding political and military control of relief supplies, with all the ensuing moral dilemmas that aid agencies must face in order to maintain their neutrality. approximately $12 billion in losses. The 1994 Northridge earthquake, also in California, resulted in costs more than twice that amount, but a year later the Hanshin-Awaji earthquake in Kobe, Japan, cost an estimated $131.5 billion. The scenario for a future repeat of the 1923 Tokyo earthquake points to losses of $2,800 billion. In part, however, this reflects a growing tendency to quantify new forms of indirect impact, especially lost production and sales. Nevertheless, the losses are undeniably rising, which points to growing economic vulnerability to disasters. Although in percentage terms insurance payments after disasters have doubled since the early 1990s, they still only cover one-sixth of losses, and the insurance industry is struggling to find the capital to underwrite huge claims: In 1992 Hurricane Andrew sent eight insurance companies in Florida into receivership. As losses increase and casualties remain frequent and widespread, the problem of natural catastrophes is topical and pressing. Expertise is gradually accumulating on how to best tackle disaster, and new agencies for managing it are forming at the local, regional, national, and international levels. For such efforts to succeed, rigorous standards need to be established for emergency planning, management, and training. There needs to be more investment in both structural and nonstructural mitigation: As it is based on organization rather than civil engineering, the latter is often more cost-effective than the former. From the point of view of understanding disaster as a phenomenon, more attention needs to be given to the role of context and culture in perceiving and interpreting the needs generated by hazards and disaster impacts. SEE ALSO E CONOMICS . Alexander, David E. (1993). Natural Disasters. Boston: Kluwer. Alexander, David E. (2000). Confronting Catastrophe: New Perspectives on Natural Disaster. New York: Oxford University Press. Blaikie, Piers; Cannon, Terry; Davis, Ian; and Wisner, Ben. (1994). At Risk: Natural Hazards, People's Vulnerability and Disasters. London: Routledge. Burton, Ian; Kates, Robert W.; and White, Gilbert F. (1993). The Environment as Hazard, 2nd edition. New York: Guilford Press. Hewitt, Kenneth, ed. (1983). Interpretations of Calamity. London: George Allen & Unwin. Hewitt, Kenneth. (1997). Regions of Risk: A Geographical Introduction to Disasters. Reading, MA: Addison Wesley Longman. Quarantelli, Enrico L., ed. (1998). What Is a Disaster? Perspectives on the Question. London: Routledge. Smith, Keith S. (2001). Environmental Hazards: Assessing Risk and Reducing Disaster, 3rd edition. London: Routledge. The greatest known natural disaster occurred some 65 million years ago when a mountain-sized comet or asteroid slammed into the earth near what is now Mexico's Yucatan peninsula. Scientists are boring a one-mile deep hole into the Chicxulub crater to learn more about the catastrophic event. By 2002, they had reached the top of the breccia layer at 2,800 feet down, bringing up a core of smashed rock-rubble. The devastation caused by the collision so drastically disrupted the earth's ecology that it brought about the extinction of dinosaurs and opened the way for the age of mammals.